The current generation of iPhone has since eluded those wishing to purchase it for a cheaper price, which would usually involve the buyer getting a refurbished option. Although Apple still does not offer a refurbished iPhone 5, you’ll be pleased to know that AT&T now have availability, and are the first to do so. The US carrier is offering all permutations of the iPhone 5, but you still have to sign into a 2-year contract with them. The 16GB model will cost you $99.99 up front when compared to $199.99 for the new model. 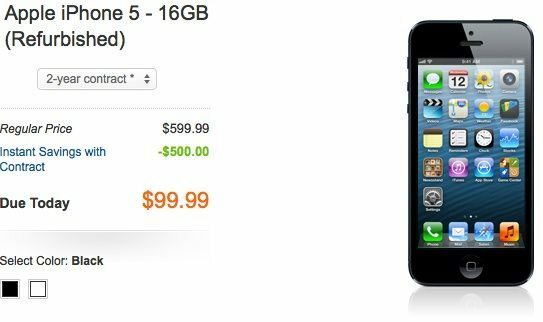 A refurbished Apple iPhone 5 – 32GB will cost $199.99, while the new model sets you back $299.99. Finally AT&T will charge you $299.99 for the 64GB version, with a brand new model costing $100 more. We’re not certain if this is a permanent offering or just a special because of what day it is, but we’re sure that the likes of Apple and the new eBay outlet will soon begin to offer refurbished iPhone 5 handsets. One question we would like to know though, do you like the idea of these reconditioned handsets when all you’re saving is just $100 — although that’s a lot considering the current financial climate? One would presume that there would be many more iPhone 5’s being returned to Apple because of the issue with scratches appearing. It’s clear that there is an issue and we have asked if Apple should bring back the Bumper case program? Currently I have a Pop case from Gear 4 on my iPhone 5, and because it’s made from a hard material and clips on pretty tight, there’s a worry that it could start to scratch the side of the handset because it’s so tight getting off. We’d just like to warn you that when you search for refurbished iPhone 5 in the search engines you’ll notice a number of websites claiming to offer these used handsets. However, just remember that these are only created in order to get you to their website, and then find that all they are trying to do is sell you other items, such as cases etc. On a final note, we have to wonder why refurbished iPhone 5’s are already being made available after just two months. Maybe they had issues, such as the scratching, the yellow screen issue or just decided that the handset was not for them and preferred an Android and Windows Phone 8 device instead? YES. These refurbs are probably just new units with scratches on aluminum (since many were reported) and get refinished in the factory or another Apple certified refurbish system stateside. I would be willing to bet this is a new phone, new warranty with the aluminum shell refinished. They just can’t sell them as new. I believe you are right. They are refinished or one’s that customer have returned within the their trial period. They are a good buy, and if not mistaken they are as you stated Apple certified and have the same warranty. I hope they are in good condition because I ordered one yesterday.